I was ready to like this book as soon as I read the description: a fantasy novel set in Imperial Russia, blending history and folklore into the plot of an escalating magical duel that would decide the fate of the empire. It looked like being in the sweet spot between fantasy and historical fiction, and therefore, in my own sweet spot. I knew I was going to like the book. I wound up loving it. I was hooked from the opening scene of friends in a bakery bantering with nobility, to the humor and tenderness that come through in Vika’s magic lessons with her father. And then intrigued by the chilly contrast of Nikolai’s own magical mentorship, where he’s in opulent imperial surroundings with a sadist for a mentor. 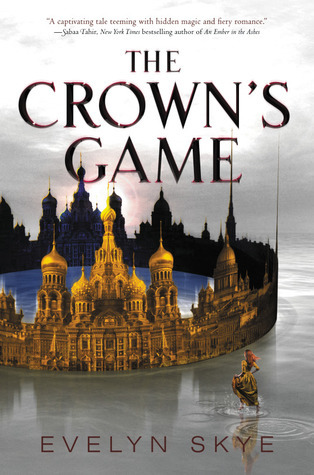 The launch of The Crown’s Game brings the students together in life-or-death competition. The winner will be the tsar’s advisor, the commander of all the magical energy of Imperial Russia. Only one enchanter can remain. The fight is to the death. The trouble is: they’ve met. They can’t quite see each other as an obstacle to eliminate, as their lives, and not just their magic, become more entwined. The story was well balanced between detailed, lush description and breathless action. (At various points, I was engrossed enough to stay up past my bedtime, and narrowly miss my train stop.) Shifting between different characters’ perspectives put me in their heads, to see what they thought of the duel and its tensions, how the magic affected them. Most of all, I liked the humanness of the characters, (yes, even the villainous ones). Seeing their thoughts, I could see their frailties, the way they were scared, or vulnerable, or motivated to lash out. Giving me a view of the heart of the characters meant it was easy to see why they did what they did, and easy to care. And hard to choose my own side in the duel. This is what I want in a fantasy novel. Detailed world-building, characters with heart, folklore, historical detail, descriptions that sweep me away and let me wander around in magic. The Crown’s Game is The Night Circus levels of good. It’s Uprooted levels of good. It’s “give me another fantasy novel this good immediately,” but unfortunately, my own bookshelves aren’t magical and can’t oblige. On the plus side: there’s a sequel. Also, the first book ends on a note that leaves questions, but also, manages to end on its own final note. Some questions are left unanswered, but they could be self-contained, rather than jarring. That’s yet another point in favor of The Crown’s Game. I need to go read genres other than fantasy for a while, as I wait to wake up from the magic of this book.